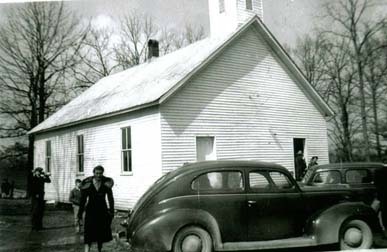 The first church was a log building that stood between the two cedar trees in the present day cemetery. In 1882 Thompson Routin donated land to the church on the west side of the cemetery. The deed for this site list the name of the church as the United Baptist Church Of Jesus Christ at Pleasant Point. Sometimes in 1883 the old log church was torn down and a new church was built at this this location. It is believed that the logs from the old church building were given to church members and used in some of the local buildings. 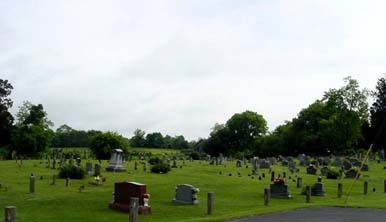 The old church site is now filled with numerous graves. The new structure was a wood frame building with white board siding. The old church was built with two single doors, which was a typical design of that day. 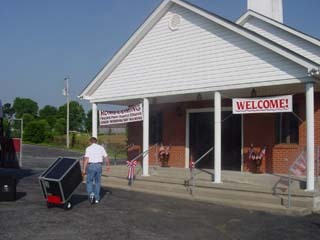 In 1943 under the leadership of Charles Jenkins the entrance was changed to a single double door opening in the center of the church.